The U.S. Air Force has welcomed the arrival of its fifth Boeing-built KC-46A Pegasus tanker at Altus Air Force Base in Oklahoma. The aircraft took off Friday from Boeing’s Seattle-based facility and arrived at Altus AFB, where the 56th air refueling squadron responsible for the tanker maintenance, aircraft and support training is based, the company said Friday. 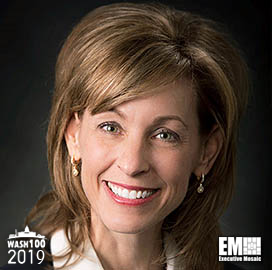 “We look forward to continuing to deliver KC-46 tankers to Altus, McConnell Air Force Base in Kansas, and New Hampshire’s Pease Air National Guard Base, throughout this year,” said Leanne Caret, president and CEO of Boeing’s defense, space and security business and a 2019 Wash100 recipient. The company said it will deliver three additional tankers to Altus AFB in the next few weeks. Col. Eric Carney, commander of the 97th air mobility wing at Altus AFB, said in a statement issued Friday the 97th AMW is prepared to train the Pegasus aircrew, maintenance and support staff to deliver aerial refueling capabilities to the joint force. Boeing delivered the first four KC-46 tankers to McConnell AFB in Wichita, Kan., in January under an initial contract for 52 Pegasus aircraft.